At the 2016 Conference, in celebration of INAFSM’s 20th anniversary, the INAFSM Board of Directors established an art glass rain drop award to be given to those members who have been chosen to receive INAFSM Lifetime Membership status. Each piece of art glass is individually hand made by artisans; no two are alike and each is unique just like each unique and special INAFSM member that receives one. 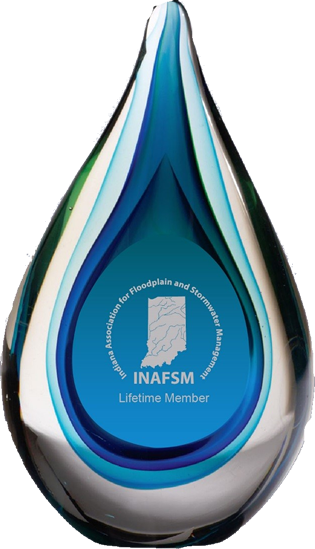 INAFSM Lifetime Membership is bestowed by the Board in recognition of a member’s Longtime Contribution and Service to INAFSM and its efforts to promote floodplain and stormwater education throughout Indiana. Lifetime Membership benefits include the same benefits enjoyed by paid members, including membership discounts on event registrations, inclusion on the INAFSM mailing list, and more.